Living Losses is a project which brings together women from all over the UK, Europe and beyond to remember children who are alienated from their loving families and to raise awareness of how this issue affects men, women and children everywhere. This is a women only project but it is not designed to exclude our loved ones, it is designed to help highlight the terrible experience of mothers AND fathers who are forced apart from their children after separation for whom the pain is compounded by the lack of understanding within society of how and why that happens. The truth is very different. The truth is that there are thousands of men AND women who are forced out of their children’s lives after separation because of the phenomenon called parental alienation. This phenomenon, which was first recognised over a hundred years ago, causes children to completely reject once beloved family members either because of the actions of one parent against the other or because of the difficult dynamics around the child. The truth is that no child, unless they are pressured unduly, would choose to completely reject a once beloved parent and those parents who are forced out of their children’s lives have to live with the pain of losing a child and the awful stigma that our society attaches to that. As women we want to let the world know that this is cruel to both children and their parents and our project is designed to bring together women, sewing on behalf of mothers, fathers and children everywhere, to create a tapestry which shows our connectedness and our support for each other, but most of all for children. 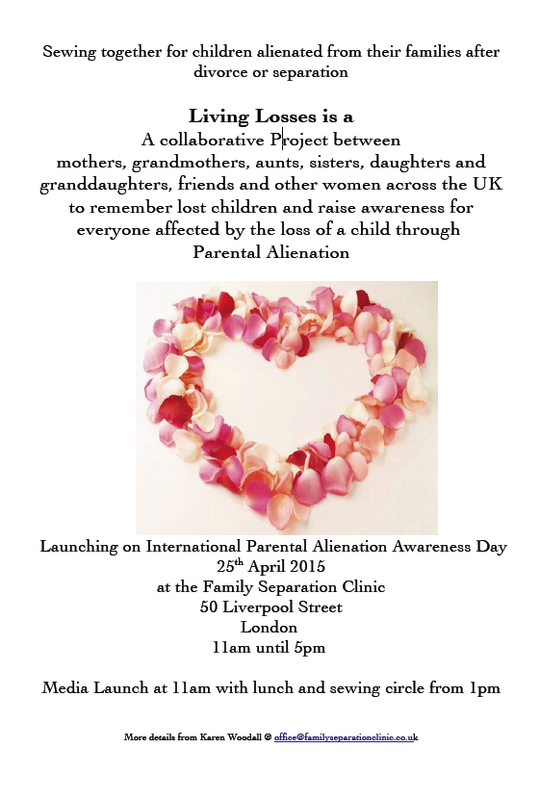 International Parental Alienation Awareness Day is on April 25th and we will launch this project at the Family Separation Clinic in London on that day. This project will kick off a rolling programme of sewing circles across the UK as well as in places in Europe and will welcome contributions from sewing circles as far away as The United States, Canada and Australia. All women, all over the world are welcome to join by holding a sewing circle and sending in their work which women in London will sew onto the tapestry. We are sewing for love and for the family and we are delighted to have the veteran campaigner for the family Erin Pizzey as part of our circle. I will be posting more about this project as we go through the year and we will be highlighting it in the national and local media. We will also join with international groups who are raising awareness of parental alienation and will add our efforts to increase awareness everywhere. If you are interested in joining us please email us at office@familyseparationclinic.co.uk either to set up your own sewing circle or to join us on the 25th April. Joining is free of charge, all we ask is that you bring along food to share and a selection of embroidery threads,, needles and other materials to share. Photo opportunities at 11am on 25/04/15 at The Family Separation Clinic – 50 Liverpool Street London. Great idea, except in Australia and New Zealand this year we are commemorating 100 years since the ANZAC forces landed in Gallipoli, Turkey. This is a big deal for us and will overshadow any other celebratory events – perhaps a different approach to awareness raising for us down under? The very best of luck with this project. As with so many things this issue gets distorted by “politics” yet it is just about helping people to do the best they can for their children ( and probably for their better selves too) . My only disappointment is that this is deemed a women only affair – in this day and age where in UK only one in ten is a stay at home mum and recognition is slowly dawning that fathers are a disadvantaged and discriminated group. Time to use your ladies’ campaign to change the poitical language: We are neither mothers nor father; we are all ‘parents’. This should never be a gender campaign! Though we fathers love you mothers all the same for what you are doing but please note the world peace campaigners still make the same error, years after and if you fail to delete ignore and oppose gender as an issue, you will continue to fail either to reach gender equality as women or to give gender equality to men. You will also fail our children. Love to you all and please make the biggest show to attract attention to our cross-gender issue. I agree we need to raise awareness. It can be anyone who becomes alienated, grandparents,family and friends. Alienated children suffer hugely because of it. They can struggle at school or find it difficult to form relationships later on in life. This is a great idea and I wish in the early years of my strughle and still today when one of my children is an adult I had support from others who have been in my situation. Its usually the father but mothers have the same issue you just never hear about it. I’m sorry but the third paragraph of this description really irked me. “No child would willingly deny a once beloved parent.” This is such a misconception! Children for whatever reason they chose dismember themselves from their parent or parental unit typically because there are much deeper issues beyond the conflict at hand. Assuming the parent is totally innocent in a situation is completely misleading and that is why this is such a controversial topic. it can irk you Kim and you can have your own thoughts but on here we are talking about parental alienation, the facts, the truth and the reality. We are NOT here to argue with people who do not believe it and who spend their time trying to tell people it doesn’t exist. The only controversy here is the one you are creating. You are welcome to post constructive thoughts and comments but you are not welcome to use this safe space to peddle your own agenda. My blog my rules, your post doesn’t get through if it inteferes with the afety and well being of the people who matter, children and the parents they have been forced to reject. There are other places you can go to have your controversial say, not here. I also don’t understand your third paragraph. I have no idea why I was alienated by two of my daughters. It is a pain unlike any other. the only think I think you might mean is that they were pressured by other forces to abandon me, i.e., significant others, friends, each other? is that it? What a great idea. Please put me on your mailing list.